"I pass the baton on to you. 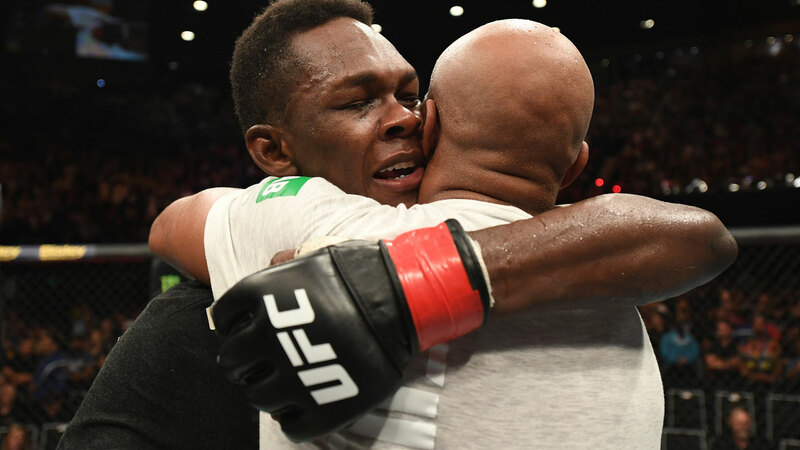 You're the best thank you for everything," MMA legend Anderson Silva could be heard saying to Israel Adesanya as the pair embraced, fighting back tears following the Kiwi sensation's victory at UFC 234. A flashy encounter that saw arguably one of the combat world's greatest strikers wind back the clock to do battle with his protege, ended in emotional scenes as Adesanya dispatched his idol in a unanimous decision victory at Rod Laver Arena on Sunday. The three-round fight, between sixth-ranked Adesanya and 15th rated former champion Silva, was elevated to main event status, after a severe abdominal injury forced champion Whittaker to withdraw from his title defence against No.1 contender Kelvin Gastelum. The win takes Nigerian-New Zealander a step closer to a potential trans-Tasman UFC middleweight title showdown with Australian Robert Whittaker, and sees the ethereal fighter take his professional record to 16-0. In the first round, 29-year-old Adesanya landed several kicks and right hands. The 43-year-old Silva, who was fighting for the first time in two years, showed some flashy moves, but fired back little in return. Silva enjoyed some success in a more competitive second round, nailing the younger man with some punches. But a patient Adesanya, who like his opponent, also displayed some showboating, dominated the third, peppering the Brazilian's face with punches as the veteran tended to drop his hands. Two judges scored the fight 30-27 to Adesanya and the third had it 29-28. Silva said it was the equivalent of facing Michel Jordan in basketball. But he drew boos from the crowd with what seemed to be a swipe at Whittaker. "I showed up to work, a lot of people didn't, even though it's out of their hands, sometimes it's not in their control," Adesanya said. The winner was in line to be the next challenger to Whittaker. There was mixed fortunes for Australians Jim Crute and Nadia Kassem, each of who was making their second UFC appearance after a first-up win. Victorian light heavyweight Crute got a first-round stoppage over American Sam Alvey, who clearly felt the fight was stopped prematurely. Kassem suffered a second round submission loss to world rated American flyweight Montana De La Rosa, who had the Sydneysider on her back for much of the bout.